The Adventures of Tioga and George: Wimping Out! "Maybe you are getting too old for this, George? Maybe you should find a senior apartment for yourself and spend your days watching TV?" ➜ I am not Wimping Out! ➜ I am not going to let doubts creep into my life because of the coincidences of these two accidents happening to me in the same day. In the year 2003, shortly after I began RVing, I began posting this mission statement in my Blog. This statement is as true for me today as it was true for me in 2003. To share the vagabonding life with our fellow RVers like yourself. We hope that you will try to boondock and dry camp. We have found great joy in camping away from the RV Campground. We would like you to try our camping lifestyle yourself. Sharing with you our Daily Adventure is our way of encouraging you to try to camp as we do. Señor Tránsito in mind, I've been thinking about trading Tránsito for a truly qualified tow vehicle. What would happen is, first fix up Tránsito cherry so that he would be pretty easy to sell. ➜ The power to tow Scampy everywhere we want to go. ➜ The proper 4WD to be able to drive on forest roads. ➜ More storage space than Tránsito has now. This might do the job. Right color too! PS: Sometimes I just crack myself up big time! Although this is a very large park, there is hardly anybody here but a few groundskeepers cutting the grass. It would be neat if I made a Nite Camp here in this peaceful place! Microsoft is less than 6-miles away! How you ever thought about installing a dash camera? Anyway I did and I can review accidents or anything else that happens along the way. I have considered a dash camera in order to view what is going on back there, as-it-is-happening. But not as a way of reviewing what has already occurred. A back up camera looks behind when you're in reverse. A Dash cam records what's going on in front of you all the time you're driving in case something happens and you want to see what really happened 'after the fact'. Definitions! I don't need no stinking definitions! Click [Here] to view that scene. I did not know the difference between a Dash Camera and a Backup Camera. George, it seems you are thinking too deep on this subject, and it's dragging you down. Simply put, just review what happened in that 24-hour period and why. 1) you were settled for the night in your nite camp and ready to go to sleep; 2) the noise from the traffic and trains started to bother you to the point you couldn't sleep; 3) so, you violated your cardinal rule of not driving at night (which is mine, too) while you were tired to find a quieter place to sleep; 4) that started a chain of events in motion which affected further your rest and sleep; 5) Conclusion--all of this is as a result of your lack of proper rest and sleep; no one's brain works well, regardless of age, if they don't have a good 6-8 hours sleep a night. Just go back to your cardinal rule of no driving at night, and don't dwell or overthink all of this. "George, it seems you are thinking too deep on this subject, and it's dragging you down." I am not being dragged down by the accidents. That is your interpretation of my mental/emotional condition. In fact, I am doing very well. Hey, George - I'm so glad you're not whimping out and are going to keep on vagabonding and blogging. I'm almost as old as you so I can be forward and offer some advice that you will most likely reject. (1) No more travelling at night, no matter what! You admit your eyesight is not what it once was. So don't risk your rig, your life and well-being, and other people and their property by driving at night. (2) Buy a Roadside Assistance Plan from either Good Sam or Coach Net. You really do need this! They provide not only heavy-duty tow truck rescues that are operated by experienced tow operaters who understand towing RVs and trailers, they also provide emergency assistance - including transportation (like towing Scampy somewhere in case Transito cannot be operated on the road). 1. My eyesight at present is better than it was prior to June, 2016. That was when I stopped taking prescription medication. Actually, my physical and mental condition has improved a huge amount. I attribute this improvement to my stopping of prescription meds. 2. A few moments ago, I purchased a membership to AAA-Southern California which includes roadside assistance for Señor Tránsito and Scampy! 3. I disagree about these two accidents being in any way significant enough to be a warning for me. a. The ditch accident occurred because I failed to exit Señor Tránsito and take a look behind. Simply a judgement error. b. The collision accident was not entirely my fault. The car that struck Señor Tránsito had crossed a bit into my travel lane. Perhaps you may claimed for yourself analytical talent in these matters which, in fact, you do not possess? In any case, in my opinion, you are way, way out there on a judgmental limb. Nope, I wouldn't wimp out either. After all my accidents, I didn't wimp out either although I'm more cautious (but not overly cautious). I still drive the freeways at speed limits, drive in heavy city traffic daily and drive long distance road trips. Live by your motto and continue your adventures but be safe. Oh, I had cataract surgeries on both eyes last year so now I can drive at night. My vision is near perfect. No more glares from oncoming traffic at night and I can read street signs clearly. Although my vision has greatly improved, I still shy away from driving at night not because I'm afraid but because I've learned to be defensive driver. From my reading this comment that you wrote, it sounds to me as though things in your life are going great! That's fantastic, Rita! And wonderful for me to read. on. Keep it up George! Your comment is as right as rain! What I like about your blog is that "you just throw it out there" for God and everyone to see. Yours is the most transparent blog I have read. May God continue to give you the courage to be George and keep you safe. Do you understand why I am able to just throw it out there? It's because of my believing that there is absolutely nothing that I do, or could ever do, that I would be ashamed of. Put yourself in somebody else's shoes An read your post. Your The one that wrote the post how do you expect one to interpret it. "There was a moment for me, immediately after my collision accident of yesterday afternoon....."
Not a permanent thought, Ed. Just a momentary thought. Nothing to hang your hat on to and make a big tsimiss about! It's today's Blog post, Ed. Not yesterday's Blog where I bring up the issue of a new tow vehicle. At this time, I am giving a new and proper tow vehicle very serious consideration. Gotta think hard on this! How unfortunate to have two "accidents" in one day. The first one actually wasn't an accident but a miscalculation that ended up with transito in a ditch. Wimping out is a word you chose. Continuing on as Tioga George vagabonder supreme is a good attitude. When the time comes that being a danger on the road to yourself or others is likely then you can look to settle down somewhere. Until then put the pedal to the metal and rip that rear view mirror off! Very expensive meals lately! Did you know that UPS trucks make more right turns than left? It's much safer! I've considered doing right turns. And stopping left turns. However, I believe that when I am paying attention [Which I always should be doing while driving], I am very safe. Not paying attention is where the trouble starts for me!! You don't need any "stinkin" advice. Just keep doing what you do. Looks good to me. I want to follow in your foot steps. Have you and I ever met? Face-to-face? "PS: Sometimes I just crack myself up big time! :"
Groan....I think you're going over board on tow vehicle with that monster of a truck. Why not get a V8 van to tow. I'm afraid you'll get yourself in bigger trouble with bigger vehicle is my opinion. While writing that Blog post about the monster truck, I was laughing sooooo hard! Love the "stinkin" comment! ...And the "judgmental limb"! Can't spend too much on steaks and waffles I'm thinking! I had a great time today. Both with comments and the Blog post about the monster truck. If you can afford it, I say do it. Wasn’t that many years ago you were worried about going broke. Whatever market decisions you made, clue us in! Really? 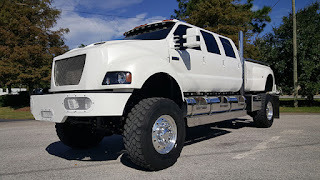 You believe that I should buy that GIANT truck? My best stock market decision was to turn over my retirement cash over to Vanguard. It's being going up ever since! Oh no you're not serious about the monster truck? I would need a ladder to get inside that nice white Giant truck! I wonder what that truck cost to buy? George, you crack me up! Keep thinking out loud as it helps keep us young. Love the truck, too. Those of who keep our brains exercising with ideas and thoughts are actually preventing the onset of brain dysfunction so keep going. You like the pic of my proposed Giant Tow Vehicle? Nice white color, dontcha think? Brain dysfunction? I hope that I don't get that!